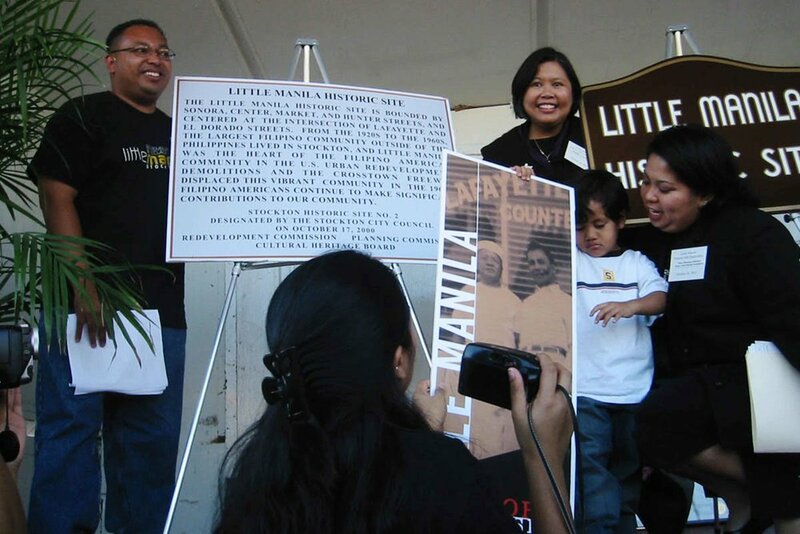 Little Manila Rising co-founders Dillon Delvo (far left) and Dawn Bohulano Mabalon (far right) at the dedication event for the Little Manila Historic Site in Stockton, California. Courtesy of Dillon Delvo. A banner marking the Little Manila Historic Site featuring Pablo “Ambo” Mabalon (left), Dawn Bohulano Mabalon’s grandfather and owner of the old Lafayette Lunch Counter restaurant in Stockton, California. Photo by Patrick Epino. The last three buildings of the old Little Manila including the Rizal Social Club (far left). Photo by Patrick Epino. Little Manila Rising co-founder and executive director Dillon Delvo and Long Distance host and producer Paola Mardo at the Little Manila Historic Site in Stockton, California. Photo by Patrick Epino. A banner marking the Little Manila Historic Site in Stockton, California is surrounded by a freeway, a gas station, and a McDonald’s. Photo by Patrick Epino. Little Manila Rising arts director Brian Batugo (center) teaches a group of students at the Little Manila After School Program at Edison High School in Stockton, California. Photo by Patrick Epino. Celin Corpuz (center) presents her group project at the Little Manila After School Program at Edison High School in Stockton, California. Photo by Patrick Epino. The students and teachers of the Little Manila After School Program at Edison High School in Stockton, California. Host and producer Paola Mardo and co-producer Patrick Epino are also pictured. Courtesy of LMASP. This episode mentions the following works and even features some clips from them. The works are shared below and are as follows: An Offshore podcast story produced by Paola Mardo about Filipino Tiki bartenders; a video of Dawn Bohulano Mabalon’s speech at the Little Manila Historic Site dedication event filmed by Dillon Delvo; a video showing the destruction of one of the last remaining blocks of Little Manila by Dillon Delvo; two music videos for the Black Eyed Peas song Bebot directed by Patricio Ginelsa and edited by A.J. Calomay. Research and interviews were conducted by Paola Mardo. Below is a list of some research sources. Paola also wrote this Buzzfeed story about why we need to remember Stockton, California’s Filipino American legacy. Title design and episode art by Paola Mardo. Special thanks to the students and teachers of Little Manila. To learn more about them and their work, head to littlemanila.org. Big thanks to my family, especially family historian Frances Pangilinan, with key assists from Gaya Lontok and Trixie Pangilinan-Mardo. Very, very special thanks to Rafael Bernardo Pangilinan. If you dig the show and want to help, here are some ways: Subscribe to the podcast. Tell your friends. Follow the show on Instagram. Join the Long Distance Radio Club. Like the Facebook page. Say hello. *There was an editing glitch around the 18:30 mark and a few words were cut off. A revised version was uploaded at 3:00am PST on Thursday, November 15, 2018. *An incorrect fact about the telephone was made around the 5:20 mark. It was stated that the telephone was invented in 1919, but early telephones and communication devices had already been made in the decades before. This statement has been removed and a revised version was uploaded at 8:30pm PST on Thursday, November 15, 2018.